If you are a student, faculty or staff at Saint Cloud State University, you can upload a website to your own Huskynet webspace. I highly recommend students in my COMM 240 upload their finished and graded website to share and understand how to upload a website and make it live on the Internet. If you are looking for a job, you can share your resume, portfolio and more with future employers. I’ve put together the steps to help you make your website live. Replace “email” with the first part of your email address (minus the @stcloudstate.edu). Locate your website folder, prepare to compressed content, not folder. Prepare an archived folder with all the content from your website. This is only the content that makes your website work, such as html files, photos, css, and other required items. Select your website content – not the folder that it’s in, see below. 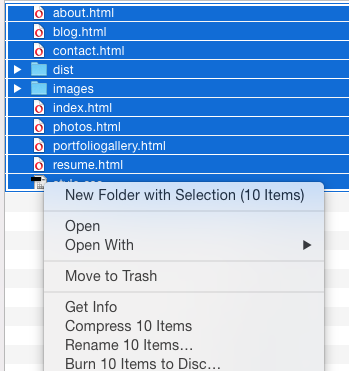 On a Apple computer, go to the finder or right click, select Compress items and an archived folder is created. Note: If your content is located in a jump or flash drive, move it to the desktop or hard drive to compress. You will receive an error message if you attempt to compress items or a folder on a jump drive. Locate the Personal file space and then the FileSpace folder. 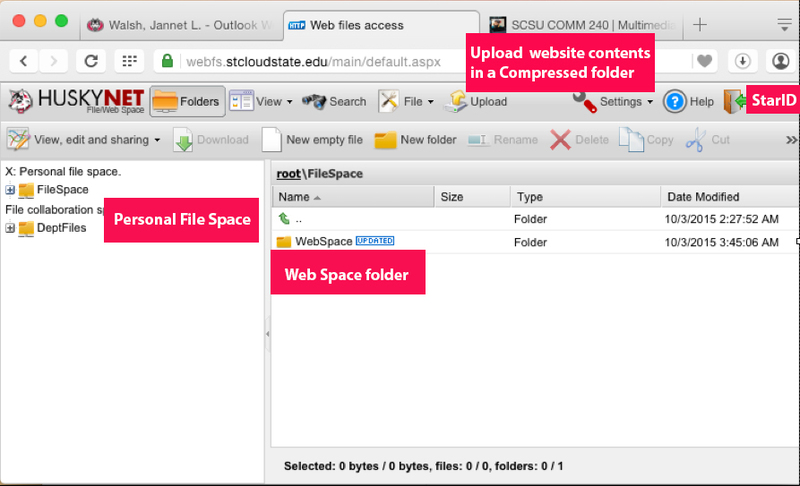 Click on the File space and a WebSpace folder will appear. WebSpace is the location your website will go. Then click save. Archived folder will appear under the WebSpace, images. Importing your website contents compressed folder – Click on the Upload icon with the yellow arrow, a box will appear to help you unpack your archived website for display. Test site – go to your website address and test your site.